On June 20, 1963, the United States and the Soviet Union agreed to set up a "hotline" between the leaders of the two superpowers. The connection, established later that summer, would be reliable and available any time of day. The hotline, nicknamed the “red line”, linked the defense departments in Pentagon in the U.S. and the Kremlin in the U.S.S.R. The Washington-Moscow hotline is still in use—only the technology has changed. The original hotline was a teletype machine, later replaced by a fax machine, and today is a tightly secured email link. The hotline has been used sporadically, to clarify American and Soviet (later, Russian) military maneuvers in conflicts such as the Six-Day War, the Turkish invasion of Cyprus, and the Soviet invasion of Afghanistan. 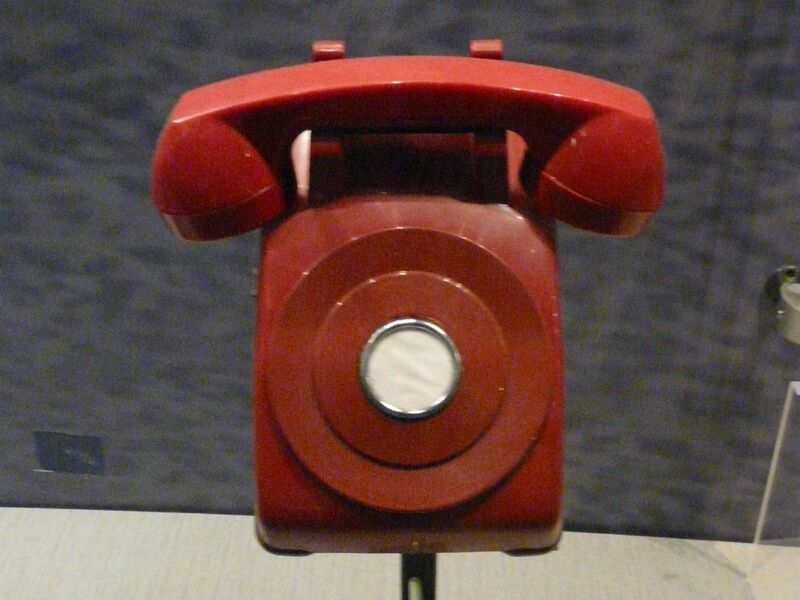 The Washington-Moscow "hotline" was never a telephone like this one, although it was popularly nicknamed the "redline." Photograph by Piotrus, courtesy Wikimedia. This file is licensed under the Creative Commons Attribution 3.0 Unported license. On June 20, 1963, the United States and the Soviet Union agreed to set up a "hotline" between the leaders of the two superpowers. The connection, established later that summer, would be reliable and available any time of day. The hotline, nicknamed the “red line”, linked the defense departments in Pentagon in the U.S. and the Kremlin in the U.S.S.R. The Washington-Moscow hotline is still in use—only the technology has changed. The original hotline was a teletype machine, later replaced by a fax machine, and today is a tightly secured email link. The hotline has been used sporadically, to clarify American and Soviet (later, Russian) military maneuvers in conflicts such as the Six-Day War, the Turkish invasion of Cyprus, and the Soviet invasion of Afghanistan.